Born Coventry, died Hull, is not the trajectory of most famous English poets. But Philip Larkin's poetry wasn't your normal florid prose, more often a glum reflection of the ordinary, and all the better for it. Larkin moved to Hull in 1955 to take up the post of librarian at the university, a post he kept for the next 30 years. Had he lived one more year I might even have met him, stamping my set text at the counter or, more likely, looking down across the tables in the Brynmor Jones Library at those pesky postgrads chattering between the shelves. After a year in bedsits, Larkin moved to a university house about a mile from the main campus. He took an attic flat overlooking Pearson Park, the first public park in Hull, initially as a temporary residential stopgap. The park had been donated to the town by its mayor, a Mr Zachariah Pearson, whose kind gift masked the fact that he'd retained the land around the edge for the building of 100 or so grand villas. And it was in one of these that Philip Larkin spent the majority of his time in Hull, before the university sold the place off and forced him to relocate elsewhere. Pearson Park remains a peaceful hideaway to this day. You access it off the Beverley Road, through an elaborate cast-iron gateway, now gate-free and oddly out of place. A looping avenue runs around the tooth-shaped expanse of grass, with a bowling green laid out close by and an unexpected police station through the trees. 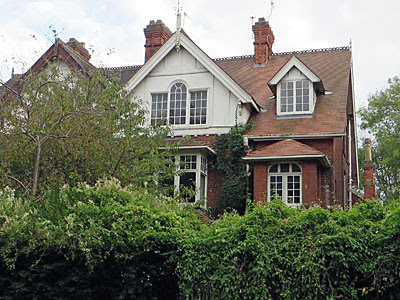 Larkin's flat was up the far end, by the wooded corner, on the top floor at number 32. But there's no plaque on the gabled frontage, perhaps because the current residents would rather not make the link to the building's heritage, or more likely because they don't want too many literary pilgrims staring gormlessly at their windows. Instead the poet is remembered by the Larkin Trail, a recent commemorative tribute scattered across Hull and the East Riding, plaque number 14 of which is affixed to the back of a nearby building in the park. I'd downloaded the whole thing before I came and meant to walk more, but I was late getting away. A couple of the adjacent villas are now care homes with gravelled approach, but number 32 is very much a private house with iron railings out front and a heavy hedge. Only Larkin's high windows have a clear view across the park, or would have done before the tree in the front garden grew its higher branches, providing inspiration for some of the poet's better known works. He'd have looked down towards the ornamental lake and the Victorian Conservatory. The latter looks like it might be just another cafe, indeed there's no sign to the contrary, but turns out to be a sub-tropical hothouse containing finches, cockatiels and lizards. As for the lakeside benches, here on a weekday afternoon sit the retired, the deliberately unoccupied and the partially inebriated. Three decades after Larkin's passing, the people of north Hull are still dodging the toad work. The fourth best band in Hull - the Housemartins - were born in a dead ordinary terraced house in a bog standard street a short walk from Pearson Park. Again there's no plaque, but the two up two down at 70 Grafton Street was Paul Heaton's rented home during the band's formative mid-Eighties years. A small ad reading "Trombonist Seeks Street Musicians" brought university student Stan Cullimore to Paul's notice, followed later by guitarist Ted and drummer Hugh. Norman Cook only joined after Ted quit the band on the brink of success - he'd been a college friend of Paul's down in Redhill, Surrey, and a co-member of the considerably less successful Stomping Pondfrogs. Three of their singles were written in the upstairs bedroom over one particularly productive couple of days in January 1986 - that's Happy Hour, Me and the Farmer and Build. The first of these broke the band big time, with the catchy melody and plasticine video delivering a Top Three hit. And it was still in the charts when I rented a room in a very similar house less than half a mile away. Housemartin fever peaked during the year I spent in Hull, which was cool, and I remember once trying to work out precisely where the famous quartet were based. This proved damned tricky in pre-internet times, restricted to gleaning titbits from radio interviews and the music press, but I think I managed to walk down Grafton Street at least once wondering which of the many houses it might be. Only on this week's visit did I finally pinpoint my goal, about halfway along on the sunny side of the street. 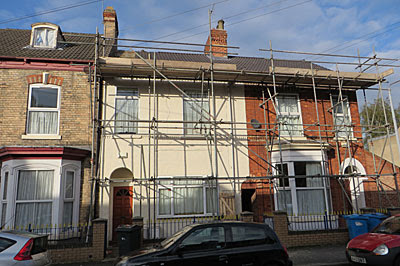 Disappointingly the front of the house was covered in scaffolding, and had been painted a bland cream colour that disguised the original Victorian brickwork. Much more excitingly a horse-drawn cart drew up outside (honest!) while one of the rag and bone men (no, really!) nipped through the narrow alley up the side of the house to collect some unwanted treasure. I would have taken a proper photo but they were staring at me quite intently so I decided to wait until they'd clopped away. I also resisted a swift pint in the Grafton pub a dozen or so houses up the road, even though this too was one of the band's key haunts, as I fear I'd have stood out rather amongst the group of smoking swillers propped up outside. London 0, Hull 4. Along with four other students assembled seemingly at random, I spent a year living in this Victorian terrace half a mile east of the university. I got the medium-sized room beside the toilet, decked out with leftover furniture, and heated by an electric fire that proved woefully ineffective during one of the coldest winters known to Hull. Using the greasy cooker downstairs was a liability, so I stuck as far as possible to meals in the Student Union and the cheapest fish and chips I have ever enjoyed from the shop round the corner. The back yard was basic rather than a useful outdoor resource, and the telephone was a party line shared with nextdoor, such were the inadequacies of the town's municipal phone company. There again the rent was only £25 a month, and the council also paid me housing benefit in case even that financial burden was too great. Heading back after all these years I wondered how much or how little would have changed. 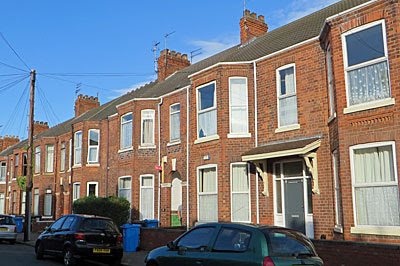 The area was still Student Central, I deduced from the bearded hoodied teenagers trotting back en masse from lectures, but this secluded enclave of terraced backstreets had also evolved to become home to some of Hull's slightly better off families. The chippie on the Beverley Road had long gone, replaced by a much wider choice of tandoori, fried chicken, Chinese and something Middle Eastern, plus there was now an independent coffee shop and even (gasp) a cocktail bar, two things the class of 86 couldn't possibly have entertained. But all this sat uneasily with the huge Lidl now plonked across the street and the string of Eastern European shops down the main road into Hull, suggesting it's the incoming students rather than the resident population with the most cash to spend. As for the house at number six, that looked much as it did in 1987, apart from the blades of an urban wind turbine whirling unnervingly close over the rooftop. I walked close enough to confirm that the front door was new, when it unexpectedly opened and one of today's students poked his head out for a trackie-bottomed smoke. A glance down the hallway brought everything briefly back, but there was to be no nostalgic linger before I was forced to retreat, just a jolting reminder that a generation has passed, and almost certainly for the better.